No matter what you study, or whatever you earn, people in India always prefer a Government job over everything. With safety and security being the primary concern, there’s no going back financially if one is successful in bagging a govt job. But, this Govt office in Bihar is different. One doesn’t have any idea when the roof might fall down on the employees’ heads. 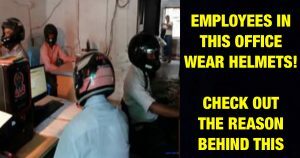 Not just the employees, higher officials, and the visitors too prefer to protect their heads while entering this office located in East Champaran district. When asked about the situation in the office, Lalan and Parvej Ahmad who work in the land records department informed that many members of the office staff have already been injured when parts of the roof fell on them. And that’s how they all decided to choose this form of safety measure. “This is quite an old building. Walls and the roof of the building are in a very bad shape. Water starts trickling the moment it rains. The roof can cave in any day. Since we can’t be absent from our duties, we all decided to wear helmets,” said the duo. In addition to that, rain water also drips from the roof and keeps falling on the files and other documents kept in the office. After inspecting the building, the construction department has already declared this building void a year ago, but it appears that the senior officials are waiting for some significant mishap to occur before the much-needed repairs are carried out.